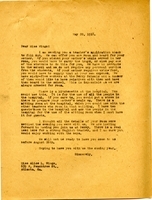 Berry responds to Wingo's questions and concerns about living at Berry. 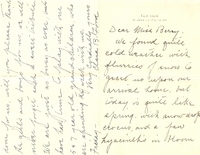 Berry writes in anticipation of a visit from a Ford representative and to invite the Fords to Berry once more. Photograph of Theodore Roosevelt and Martha Berry during a visit to the Berry School. Portrait photograph of a young Martha Berry. 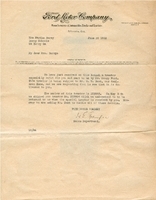 Letter to Martha Berry from Ford Motor Co.
Letter from the Ford Motor Company Sales Department referring to the delivery of a special tractor built for Berry and sent to the dealer by Henry Ford. 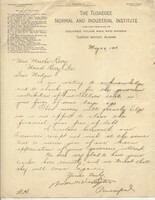 Washington writes to Berry to thank her for the contribution of five dollars and wishes that her school too would have a successful financial year. He also expresses that he was glad to have Berry teachers visiting his school and hopes they will visit again. 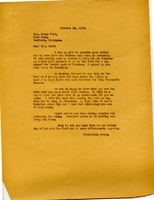 Thank you note from Clara Ford to Martha Berry sent in 1931.